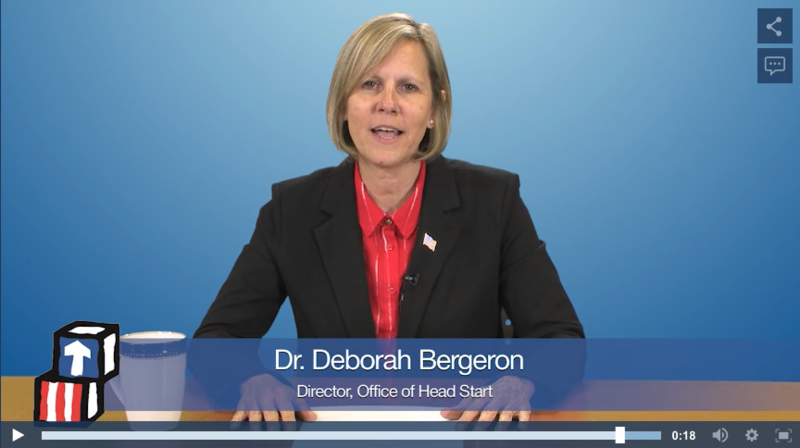 On Monday, the new director of the Office of Head Start (OHS), Dr. Deborah Bergeron, released a video message discussing the important transition for children from Head Start to Kindergarten. Dr. Bergeron called for increased collaboration between Head Start programs and elementary schools so that school readiness standards are aligned. In her video Dr. Bergeron, a former elementary school administrator at a school with Head Start classrooms, took time to reflect on the barriers that can impede strong relationships between schools and Head Start programs. While all educators want children to be ready for Kindergarten, Dr. Bergeron noted that there needs to be an intentional shift to build relationships between Head Start, school principals, superintendents, and the Department of Education in order to smooth the transition for kids. With that goal in mind, she discussed a change to monitoring guidelines for Head Start in the coming months. This shift aims to accomplish three things: allow Head Start programs to be reflective about their own practices, lift up best practices of relationship building and alignment of standards, and finally, break down barriers between Head Start and Kindergarten classrooms so that students are best prepared to transition from Head Start. Dr. Bergeron’s call to improve alignment between Head Start and schools is in line with the provision of ESSA that requires local education agencies to coordinate with Head Start programs to ensure children are ready for school. At the end of July, Dr. Bergeron plans to bring together various stakeholders like Head Start Directors, school leaders, superintendents, and the Department of Education to begin these conversations about improving readiness for children exiting Head Start. Given the importance of the transition between Head Start and Kindergarten for students, it is exciting that Dr. Bergeron is focusing on this important issue so early in her tenure. Originally reported by POLITICO’s Mel Leonor.